A clean home is very important for you and your family’s health. It also makes you feel better – nobody enjoys a dirty, cluttered home. A clean home will inspire you to focus on other things that make you smile. Still, it’s sometimes hard to keep a clean home with all your other obligations and your work. If you feel you need to learn new tricks to make this process faster, here are some very useful ones, which will make sure your home is spotless every single day. The following tasks won’t take up too much of your time but will ensure you maintain a clean home. First of all, it’s better to hang your jacket than to throw it on the chair or a couch. Every time you wash your teeth, wipe the bathroom sink, which will prevent build-up. Every time you use a plate or a glass, put it in the dishwasher straight away. Don’t pile up the dishes in the sink. Also, if doing laundry is your everyday task, then do it the moment you get up of before you go to bed, depending on when it suits you. When you start cleaning your home, remember the rules of physics – there’s no point in fighting gravity. So, always start from the top floor and work your way to the ground floor. That’s how you’ll avoid going through some rooms twice. When you start cleaning a room, apply the same rule – start from the ceiling by removing cobwebs and upper molding. Next, dust the light fixtures and a ceiling fan, then move on to the window frames and wall hangings. Next, switch to the furniture, shelves and flat surfaces, and then finish with the floor and the carpet. This will prevent the durst from the upper levels falling down on the lower levels while you dust and clean. Time management tricks mean a lot when it comes to cleaning. The smart thing to do is to spray on cleaning chemicals on the surface then move on to do something else while the chemicals do their job. For instance, when you’re cleaning the kitchen, spray the cleaner on all the counters and then move on to clean the fridge and remove the old food while the cleaner is soaking in. When you’re done with the fridge, you won’t have to scrub for a long time or at all because the cleaner will do most of the work for you. When you start with the cleaning, always start with the gentle cleaning process. No need for aggressive techniques and cleaning agents if the surfaces are not very dirty. Also, some surfaces are very sensitive to aggressive agents, so you need to know what types of cleaning agents you are allowed to use in order not to damage the surface for good. It would also be wise to consider eco-friendly cleaning agents – they are very effective but they are not harmful to the surfaces you want to clean nor are they harmful to your health. Many cleaning services use them in case you want to have professionals clean your home from time to time. 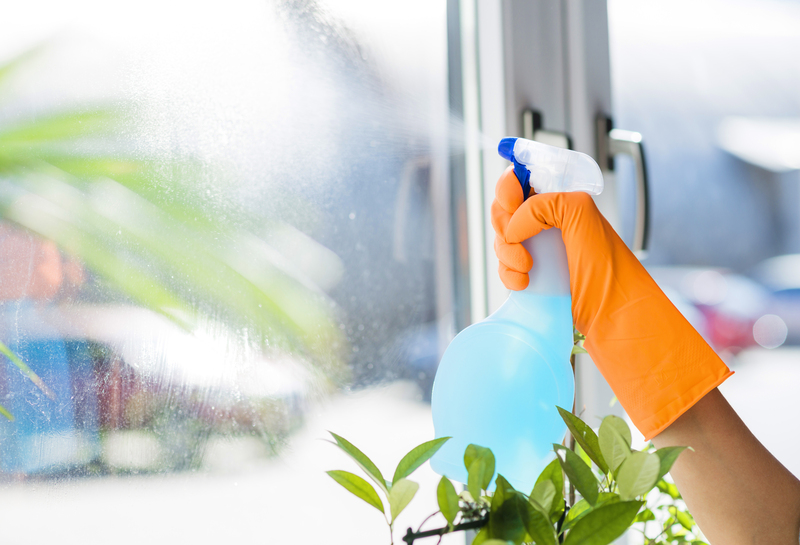 If you have a big home, you will save yourself a lot of time if you avoid going around your home, looking for the right cleaning agents or tools. That’s why it’s best to buy the right tools and equipment to save yourself some time. First, get a plastic carrier with a handle and a couple of compartments to place your gear. Next, find a big plastic bucket with a firm handle, as well as a rolling cart where you can place the necessities. Wearing an apron with large pockets can also come in handy. Place all of your cleaning supplies in one big box or any other container. Put all the clean rags, paper towels, as well as trash bags there and make sure you can take it with you from one room to another easily. The traditional mop has proven to be full of different bacteria. A microfiber duster will make your home less contaminated as it doesn’t harbor so much bacteria. So, when you’re done with the vacuuming, you just need a bit of a cleaner applied to the microfiber pad. You can use the pad to clean the floors, as well as any other surface, including the electronic ones. And you won’t have to get your hands dirty. To keep a home clean, it’s always easier to deal with the small things right now than to leave it piling up. Using every trick available will save you a lot of time and ensure your home is clean for a long time without you having to put in too much effort. Instead, you’ll have more time to enjoy and relax in your own home – that’s what homes are for, right?